Manor Farm Cottage01263 715779work01603 870304fax Self-cateringManor Farm Cottage sits in a secluded area surrounded by marvellous views of local paddocks and fields. Perfect for couples wanting a secluded break in the tranquil countryside, an array of pursuits for guests awaits them here. A good selection of walks, cycle routes, pubs and shops are nearby. The property has comfortable furniture and modern utilities. 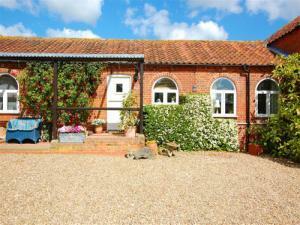 Manor Farm Cottage sits in a secluded area surrounded by marvellous views of local paddocks and fields. Perfect for couples wanting a secluded break in the tranquil countryside, an array of pursuits for guests awaits them here. A good selection of walks, cycle routes, pubs and shops are nearby. The property has comfortable furniture and modern utilities.